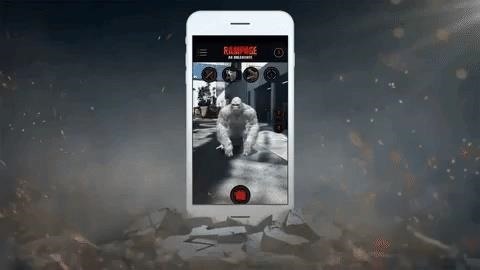 Given Dwayne "The Rock" Johnson's blockbuster movie pedigree and the promotional power that usually accompanies his work, there's a certain predictable symmetry in the news that Rampage, a movie adaptation of the classic arcade game, has now become an augmented reality mobile app. 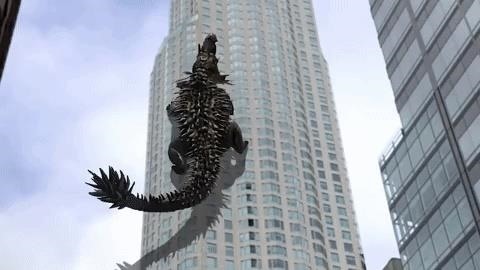 Rampage: AR Unleashed, developed by Los Angeles-based AR studio Trigger, is available now on the App Store and Google Play. With the app, users can summon George the gorilla, Ralph the wolf, and Lizzie the alligator into their immediate environment and watch them (virtually) demolition their surroundings. In addition, users can scan movie posters to see George the gorilla smash the fourth wall, and the destructive hijinks can be captured in photos and video for sharing on social media. In recent months, augmented reality has become a popular means for promoting or further monetizing movies, with Black Panther, Jurassic World: Fallen Kingdom, Ready Player One, Transformers: The Last Knight, and Star Wars: The Last Jedi among the more recent examples. The technology also seems to be particularly popular for movies starring The Rock, with the recent reboot of Jumanji bringing the star to an augmented reality cover of Entertainment Weekly along with Snapchat World Lenses for the theatrical run and the home video release. That could be all coincidental, but, then again, I'm looking forward to the Black Adam AR experience.